Combine chicken broth and water in a saucepan, bring to a boil and keep at a low simmer (you may not need to use the full amount of liquid). In a medium saucepan, preferably wide and with round edges, heat the olive oil and add the minced shallot. Season with salt and pepper, cook until soft and translucent. Add the rice, and cook until it starts to get a little color, about 4 minutes, stirring constantly so the grains don’t stick to the bottom of the pan and burn. Add wine; cook, stirring, until absorbed, about 2 minutes. Add 2 big ladles of hot chicken broth, and cook until absorbed, stirring occasionally. Continue adding broth mixture, 1 cup at a time, waiting for liquid to be absorbed before adding more, stirring occasionally, until rice is just tender and creamy with a little liquid remaining in the pan, about 25 minutes. Stir in the spinach, peas, carrots, and finish with the butter. Adjust seasoning if needed. How perfect for spring. I love spinach – lucky you to have some freshly harvested. Sally, this has nothing to do with your wonderful risotto. I just saw that tornadoes hit Norman. I hope you and everyone else are safe. Call me (home first, mobile if no answer) if you want me to drive out to your house. The next round won’t hit until evening so get an early start on your drive. I use frozen peas all the time. No shame in them. They seem to hold up and taste better than other frozen veggies. I love this recipe and you are so right, one cannot have enough risotto recipes. I love risotto.. I sometimes end up with a pot of “mash”.. but plan to have another go at it! This looks awesome!! The colors look so great in this risotto! 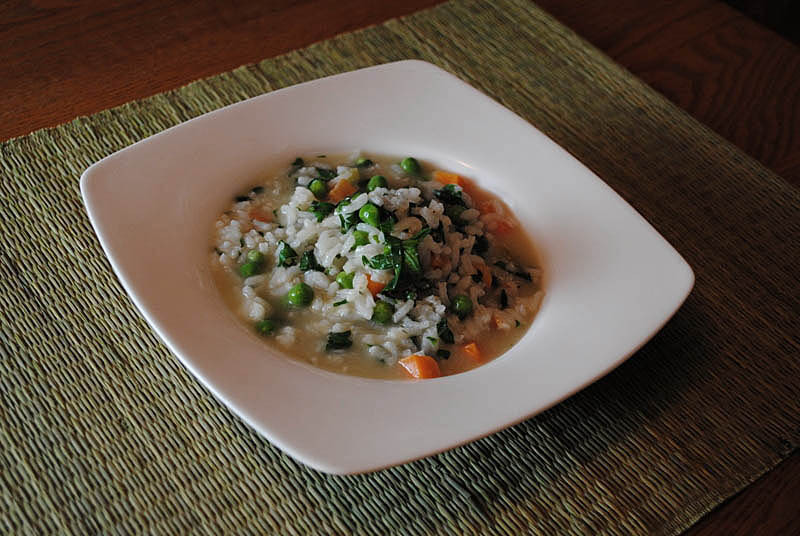 I love spring vegetables in risotto, and the fresh spinach sounds great. And, it makes me wish I had a greener thumb.